Dr. Salmón is a Rarámuri (Tarahumara). He feels indigenous cultural concepts of the natural world are only part of a complex and sophisticated understanding of landscapes and biocultural diversity, and he has dedicated his studies to Ethnobiology, Agroecoclogy, and Ancestral Ecological Knowledge in order to better understand his own and other cultural perceptions of culture, landscapes, and place. 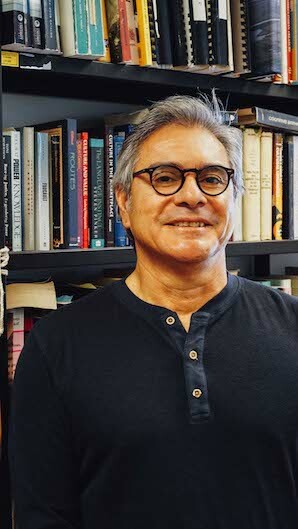 Dr. Salmon's recent studies have led him to seriously consider the connections between Climate Change and Indigenous traditional food ways. Indigenous homelands have been noticing the effects of Global Warming and Climate Changes first, but they are also able to possibly offer solutions for ways to feed the planet due to the resilience of traditional food ways worldwide. Food ways are connected to every element and process of sustainable bio-cultural diversity meaning that all facets of sustainable food ways including cultural expressions, landscapes, education, leadership development, networking, and policy should be understood and supported. Dr. Salmon has written a book focused on small-scale Native farmers of the Greater Southwest and their role in maintaining biocultural diversity. It is titled, Eating The Landsfape. Dr. Salmon has a B.S. from Western New Mexico University, an MAT in Southwestern Studies from Colorado College, and PhD. in anthropology from Arizona State University. His dissertation was a study of how the bio-region of the Rarámuri people of the Sierra Madres of Chihuahua, Mexico influences their language and thought; poisonous plants used for medicine was the focus for the study. During his doctoral course studies he was a Scholar in Residence at the Heard Museum. He has been on the Board of Directors of the Society of Ethnobiology and the Cultural Conservancy. Dr. Salmon has published several articles and chapters on Indigenous Ethnobotany, agriculture, nutrition, and traditional ecological knowledge.